Why do you have a special cushion on your breast flanges? In order to make a mom’s pumping experience as comfortable as possible, we added the special rubber outer rims to the breastflange called ComfortFit™ Cushion. These special outer edges ensure a mom has a good seal which aids in the suction. Can I return to the let-down or stimulation phase once I am in the expression phase? Yes, if you achieve let-down prior to the 2 minute automatic switchover, you can push the let-down button and you will go into the expression phase. If you wish to return to the faster let-down phase during a pumping session to elicit another let-down, you can switch back into the let-down phase by pushing the let-down button again. A mom can adjust to her comfort level by pushing the + button to increase either speed or suction or pushing the – button to decrease the speed or suction. Can I use a microwave steam bag to clean and sterilize the pump parts? Are parts dishwasher safe? All parts can be steam-sterilized in a microwave bag except the tubing which never needs to be cleaned or sterilized because it does not come into contact with breastmilk. You can also use boiling water to sterilize as well. All parts are dishwasher safe though we highly recommend gently hand washing the white valves as they are delicate and can affect the performance of the pump if damaged or torn with vigorous washing or harsh detergents. Please be sure to use the appropriate amount of water according to the directions on your steam sterilizer to ensure that parts do not get overheated and/or melt. Please note that all pump parts must be completely dry prior to use or performance may be affected. What materials do you use in the Lansinoh® Affinity® Double Electric Breast Pump? Can I use other pump brand replacement parts with the Lansinoh® Affinity® Double Electric Breast Pump? We do not recommend using another pump’s replacement parts (including the first generation Lansinoh® Double Electric Pump) with the Lansinoh® Affinity® Double Electric Breast Pump as the components of our pump were made specifically for our pump. Also, using other pump’s parts with our pump would void your warranty. Do you sell accessories for the pump like extra parts, cooler bag, freezer pack, and carry bag? You can order all extra parts including a cooler, re-usable freezer pack, and carry bag for any of the Lansinoh breast pumps online at our website. Can I use batteries with the Lansinoh® Affinity® Double Electric Breast Pump? The Lansinoh® Affinity® Double Electric Breast Pump can work with either the AC Adaptor (included) or with 6 AA batteries (not included). You can use either alkaline, standard (carbon-zinc) or rechargeable batteries, but do not mix alkaline, standard or rechargeable batteries. Do not mix old and new batteries; replace as a simultaneous set. If batteries are in the pump, but your AC adaptor is in use, the pump will use the AC adaptor to power the pump. For the most economical use, we recommend using the pump with the AC adaptor that has been provided with the pump. Do you have a car adaptor to power the pump? The Lansinoh® Affinity® Double Electric Breast Pump does not come with a car adaptor. It is powered with the AC adaptor that was included or 6 AA batteries. 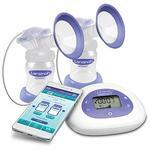 How many times does the Lansinoh® Affinity® Double Electric Breast Pump cycle? 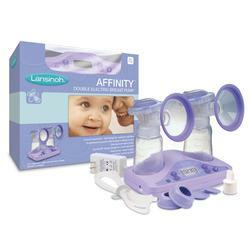 The Lansinoh® Affinity® Double Electric Breast Pump cycles 30-60 times per minute. There are 6 cycle settings. 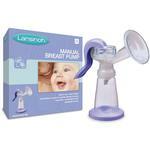 What is the suction range of the Lansinoh® Affinity® Double Electric Breast Pump? 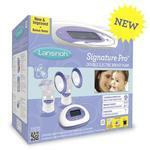 The Lansinoh Double Electric Breast Pump ranges from 50-250 mm HG in 1 second. There are 8 suction settings. Can I pump directly into the Lansinoh® Breastmilk Storage Bags? Why not? Unfortunately, you cannot pump directly into the Lansinoh Breastmilk Storage Bags because they have a double zipper closure and therefore, will not fit securely on the pump. How can Lansinoh guarantee milk from backing up into the tubing? What is the importance of this feature? Using a specially-designed diaphragm and diaphragm cap, our pump is guaranteed to prevent milk from backing up into the tubing and into the motor unit. This is important from a hygienic perspective (condensation and/or milk in tubing can mold and breed bacteria) and from a perspective of understanding how important every drop of your milk is to you and your breastfed baby. Is the Lansinoh® Affinity® Double Electric Breast Pump powerful enough for daily use like for a working mom? The Lansinoh® Affinity® Double Electric Breast Pump has been designed for occasional and/or daily use and it is certainly powerful enough for a working mom or a mom who will be apart from her baby for regular intervals. As with other retail pumps, it is to maintain an already established milk supply. How do I know when to stop pumping? The stream of milk will begin to slow or stop and/or your breasts will feel softer and less full. A breast is never truly “empty” but it will be apparent with these clues that you can stop pumping. Where can I buy the Lansinoh® Affinity® Double Electric Breast Pump? Click Where to Buy. There is a zip code sorter where you can enter your zip code to find local stores that carry our products. What is the warranty for the Affinity® Double Electric Breast Pump? Please see the Lansinoh Affinity® Double Electric Breast Pump Instruction Manual for information. Please note that once opened, the Affinity Double Electric Breast Pump cannot be returned for hygienic reasons. In order to make a claim under the warranty for your pump, you must first obtain a Return Authorization Number by contacting our customer service department by phone at (800) 292 4794.